I’m so sorry for the being absent in the last couple of days…or weeks, but today I’m back with a new review! 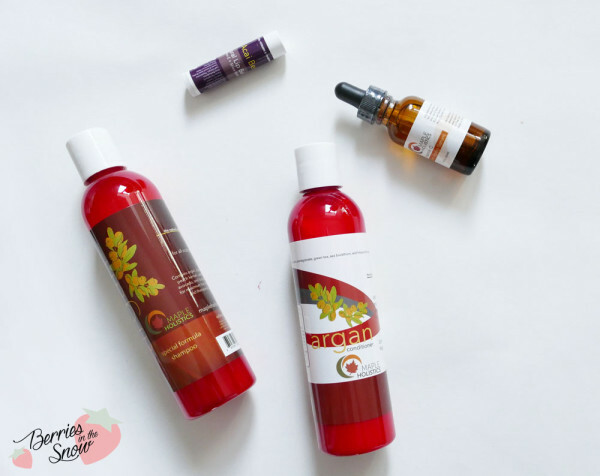 :) Actually, here are 3 reviews I will be discussing in this post, all of them dedicated to a couple of really awesome MapleHolistics Natural Beauty Products. It could be especially interesting for those of you looking for products with a short ingredients list consisting only on the necessary…and of course for all of you who love natural beauty products! Upon request by MapleHolistics I was allowed to choose products of interest and they were so kind to send me all the products I was interested in, which were a argan shampoo and conditioner and a vitamin C serum. They were so kind, that they even included a lip balm on top! 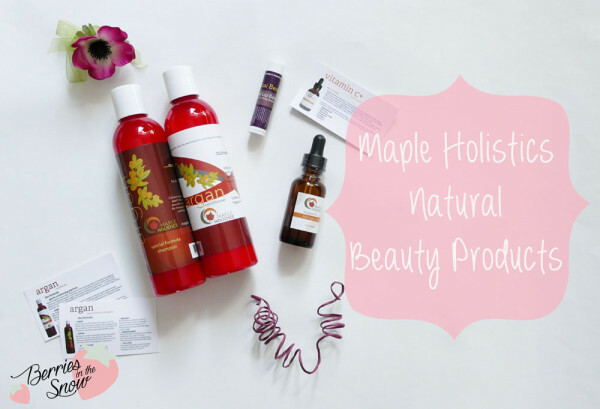 Since I really do like all of the products and I’ve been testing them very thoroughly I can really recommend you to keep on reading and maybe also take a look at the range of products by MapleHolistics. MapleHolistics is a US based beauty company that has been around for the past few years. They develop and manufacture their own all natural cosmetics, which is also animal cruelty free, and focus mainly on shampoos and conditioners. Nevertheless, you will spot some skincare and bath and body products on their web page, too. I decided to do a review about the Argan Oil Shampoo and the Argan Oil Conditioner. Argan Oil is one of my favorite haircare ingredients, since it makes my hair less frizzy and manageable. I love the Argan oil products from Confume, for example and I’m using them almost daily. I also chose the Vitamin C Serum by MapleHolistics. I was drawn to this serum by the short and really good ingredients lists here. And last but not least I received a Acai Berry Lip Balm on top. I’ll start of with the Argan Oil Shampoo and Conditioner: MapleHolistics Argan Oil Shampoo and Conditioner is designed for men and women. 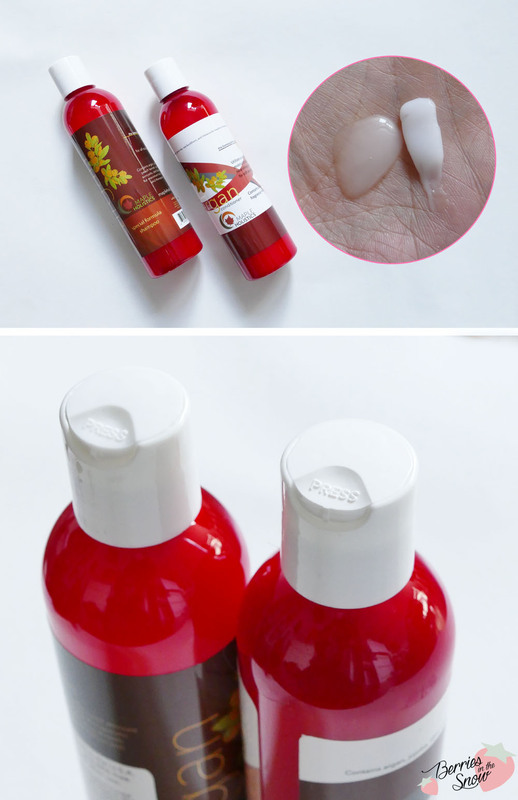 It comes in a red plastic bottle with a simple design. Some illustrations on the label make it still look appealing. 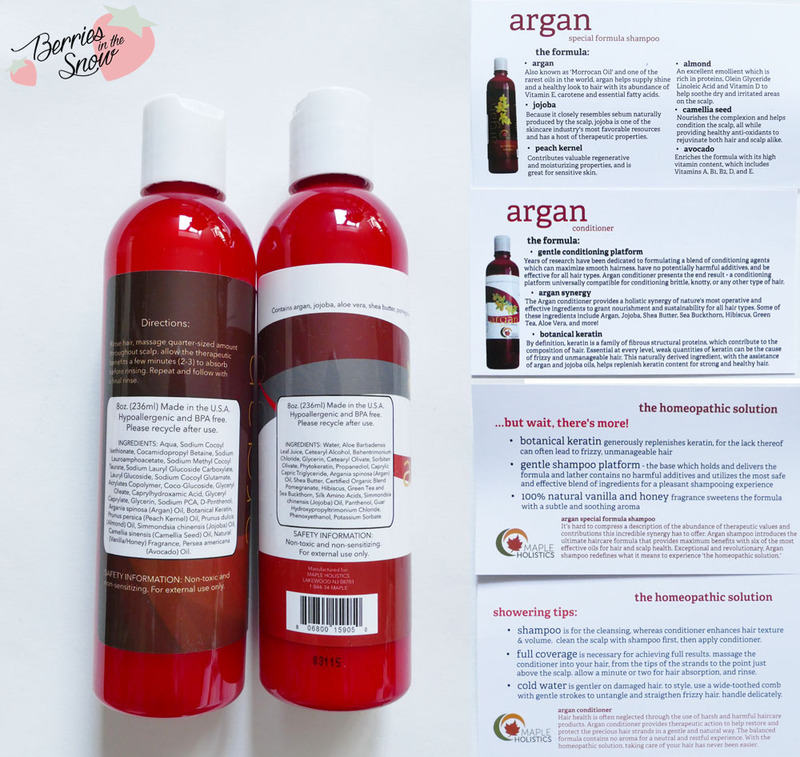 Since the bottle of the shampoo and the conditioner is both red, the difference of the two products lies in the color of the label, which is red/brownish for the shampoo and white in case of the conditioner. Also the consistency of the products is different: The shampoo is more runny and has a milky color whereas the conditioner is a white balm product. The scent of the Argan Oil Shampoo and the Conditioner is very subtle and not heavily perfumed at all. In order to dispense the shampoo you can press the cap. This kind of bottle is convenient if you are traveling. Argan: Also known as ‘Moroccan Oil’ and one of the rarest oils in the world, argan helps supply shine and a healthy look to hair with its abundance of vitamin E, carotene and essential fatty acids. Peach Kernel: Contributes valuable regenerative and moisturizing properties, and is great for sensitive skin. Jojoba: As it closely resembles sebum naturally produced by the scalp, jojoba is one of the skincare industry’s most favored ingredients and has a host of therapeutic properties. Avocado: Enriches the formula with its high vitamin content, which includes vitamins A, B1, B2, D, and E.
Camellia Seed: Nourishes the complexion and helps condition the scalp, while providing healthy antioxidants to rejuvenate hair and scalp alike. Almond: An excellent moisturizer,which is rich in proteins, olein glyceride, linoleic acid and vitamin D to help soothe dry and irritated areas on the scalp. Botanical Keratin: Keratin is a family of fibrous structural proteins, which contribute to the composition of hair. As it is essential to hair’s formation, insufficient quantities of keratin may be a contributing factor to having frizzy and unmanageable hair. This naturally derived ingredient helps to replenish the ideal keratin content for strong, durable hair. Honey and Vanilla: With their light and sweet fragrances, these ingredients enrich the formula for a balanced and soothing experience. Shea Butter and Green Tea: These helpful ingredients are fast-absorbing and commit moisturizing qualities to dry and delicate hair strands. Shea butter, in particular, contains vitamins A and E, making it an excellent natural moisturizer for the hair. It locks in moisture without leaving the hair greasy or heavy. Green tea contains epigallocatechin gallate (EGCG), which strengthens hair roots, activates hair follicles and promotes hair growth. Pomegranate, Hibiscus and Sea Buckthorn: Certified blend assists in repairing damaged hair follicles to revitalize healthy, flowing hair. Pomegranate contains ellagic acid, which prevents the moisture in the hair from drying out. Hibiscus (“the flower of hair care”) helps prevent dryness, dullness, and hair damage. It also prevents problems like dandruff, split ends, and premature graying. Sea buckthorn, on the other hand, contains high levels of Omega 3, 6, 7, and 9, as well as vitamins A, B, C, D, E, and K that promote healthy skin and hair. Both products work great on my hair and although the Argan Oil Shampoo is sulphate free it leathers up really nicely and generates a soft foam. Furthermore my hair does not feel dry after using these two, which is my main concern with other sulphate free shampoos. The hair is shiny and I can comb it easily even while it is still wet. I definitively like this shampoo and conditioner and it is worth to have a look at it, if you are on the look for a sulphate free shampoo at the moment. The bottles contain 8 oz and retail for 12.97 US$ for the shampoo and 7.89 US$ for the conditioner. It is probably more expansive than a lot of drug store hair products, but after all I think it is worth it. 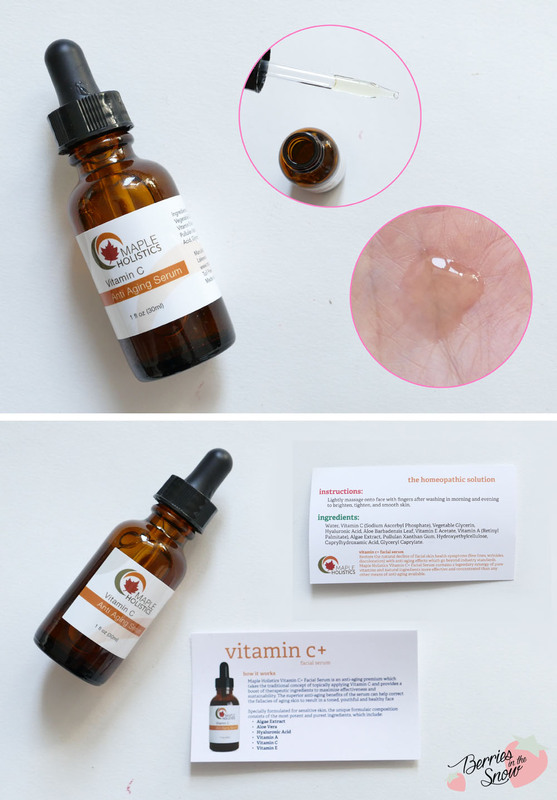 So this serum contains not only Vitamin C, but also Vitamin A and E, plus hyaluronic acid and quite important Ferulic Acid to stabilize the Vitamin C. Really a lovely ingredient list! My skin didn’t react to this serum and I’ve been testing it for a month now. Definitively a very good serum! The bottle contains 30 ml and and retails for 11.77 US$ which is affordable compared to other Vitamin C serums. 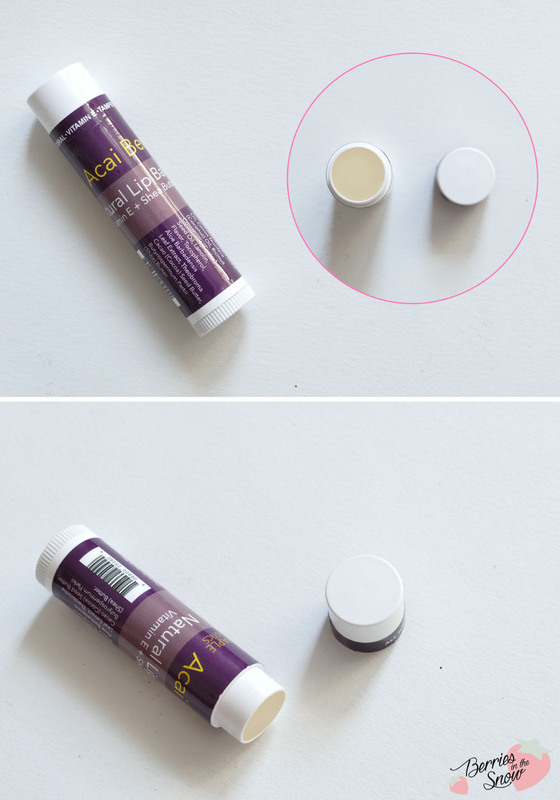 Lastly, here is my impression on the Acai Berry Natural Lip Balm by MapleHolistics. This is a solid, but simple lip balm consisting mainly of Shea butter, coconut oil, cocoa butter and sunflower seed oil. Vitamin E and Aloe leaf extract give some extra moisture and nutrition to your lips. It has a fruity-sweet scent reminding of berries and does a good job in hydrating the lips. Moreover, it comes in this bullet shape and is more hygienic than lip balms which come in containers where you have to use your finger. Unfortunately, I couldn’t find it in the shop, but this lip balm contains 4.25 g in total. It was really a nice surprise to receive this and I’m using it daily and I’m totally happy about it, too!